Visionary is one of the most frequently used words to describe Steve Jobs. Nearly a year after he passed away, historians are still digging up treasures from his life that confirm that assessment. The Next Web writes of a speech Jobs gave in 1983 at the Center for Design innovation. After that speech, he had a question-and-answer session that covered a wide range of topics, one of which was an incredibly detailed assessment of Jobs' vision for a "computer in a book" that one could learn how to use in 20 minutes. "Apple’s strategy is really simple. What we want to do is we want to put an incredibly great computer in a book that you can carry around with you and learn how to use in 20 minutes. That’s what we want to do and we want to do it this decade," says Jobs. "And we really want to do it with a radio link in it so you don’t have to hook up to anything and you’re in communication with all of these larger databases and other computers." The full recording of the speech including the Q&A is available at LifeLibertyTech.com, with the Q&A starting about 21 minutes in. Walter Isaacson also revealed some tidbits behind the development of the iPad in Steve Jobs' biography. Not many of us live long enough to see our own dreams come true. Steve was a major exception. 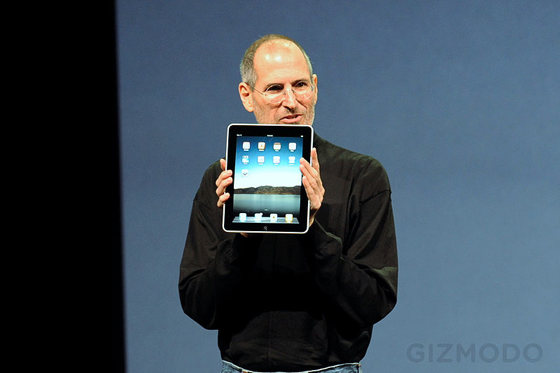 He accomplished that except for one thing: you can learn to use an iPad in TWO minutes! ...and how long before that did they envision a tablet computer in a science fiction film/show? And this is news? How? front page??? Only 15 years after Alan Kay, then. Visionary, indeed. (That said, Jobs indeed had great vision - or taste, as Bill G once put it). Imagination and execution are two completely different things. Steve made his visions into tangible reality. Not a concept demo, a physical product you could walk into the store and buy. Many others only dream, but fail to follow through. And if you have any experience with invention, the hardest part isn't in the idea, but actually making it work. That's not to say Alan Kay wasn't a genius as well. He had the vision before anyone else. But he didn't get it right. What he delivered was not what the market wanted. Visionary indeed :) Amazing. He was full of great ideas. If only he were still here. We would've been able to see what else he had in store for us. Hopefully, he left some pretty exciting things behind for Apple. But I will miss the excitement with which he introduced his ideas to us.